We spent about 3 hours looking at houses today; for the most part we looked at fixer bungalows, but they were mostly too far gone to save, in crummy neighborhoods, or just too expensive for the effort. So many of these sellers are underwater. In fact, one of them that was listed for $300K had mortgages totaling $606K. What were those banks thinking? Anyway, we found two really nice bungalows on the downtown grid that we really liked. Their current prices are too high for the comps and current housing market, but we went and looked at them anyway. We figure once we've seen them, we can watch and see if they sell or if they continue to drop their prices until they're in our range. One of the houses, on 5th St, is almost exactly what I'm looking for in a historic bungalow. It has the original woodwork, unpainted, and they haven't messed it up too much. 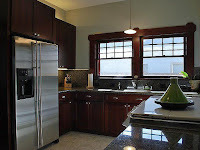 When the current owners remodeled the kitchen, they also did a fairly decent job of matching the wood color to the rest of the house. They did convert the closet in the master into a bathroom, which is a bit weird since now it's hooked to two bathrooms, but we could undo a bathroom a lot more cheaply than putting one in. Otherwise, it's quite attractive. The other house was a total surprise, I expected we wouldn't like it, but we both did. It's located on Julian St near Third. This one, unfortunately, has had every bit of the woodwork painted white and it's had some unfortunate remodeling, but it has a really huge lot for being downtown (7500 sq ft) and it has a ton of space, being more than 2000 square feet. This must have been one of the rich person's houses downtown. 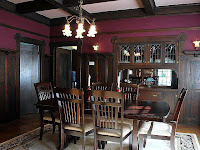 It looks like they carved up some of the space into apartments as it has two kitchens; one of them installed in the front parlor. But the woodwork is mostly intact (except for the paint) and it seems to be in good condition as far as we could tell. Though it was weekend, there wasn't really that much traffic. I wonder how much traffic there is during the week? Probably quite a lot more. But at least it has lots of parking and I think the lot has 2 garages and a few mature trees. Update on Monday, after I corresponded with our realtor: Apparently the house on 5th is very mortgaged. While their mortgage is less than their la-la land asking price, it's well above their likely market value, so we surely won't be buying this one. Unless the seller walks and doesn't ruin it and the bank takes it over and offers it for something realistic. Oh well, what a shame. The house on Julian, however, appears to be owned free and clear and has been in the same family since nearly the beginning, so there is some hope on that one. Though that one is even further above what we want to spend on a house, so unless that one sits on the market for quite a while unsold and the price gets a deep reduction, it looks like this shopping trip was mostly window shopping. Both houses look absolutely gorgeous! Kelly has friends who live in downtown...I think on 3rd or 4th. Can't remember. It's just a couple miles from the train into San Fran, and they have a parrot, too, inherited from her mother. Small world. Hope you're well!